At the start of the 2018/2019 school year, LWV students set up a table with volunteers and talked with fellow students about the work of LWV and asked other students to join their group. Thirty-seven students expressed interest in the work of LWV at this tabling event! 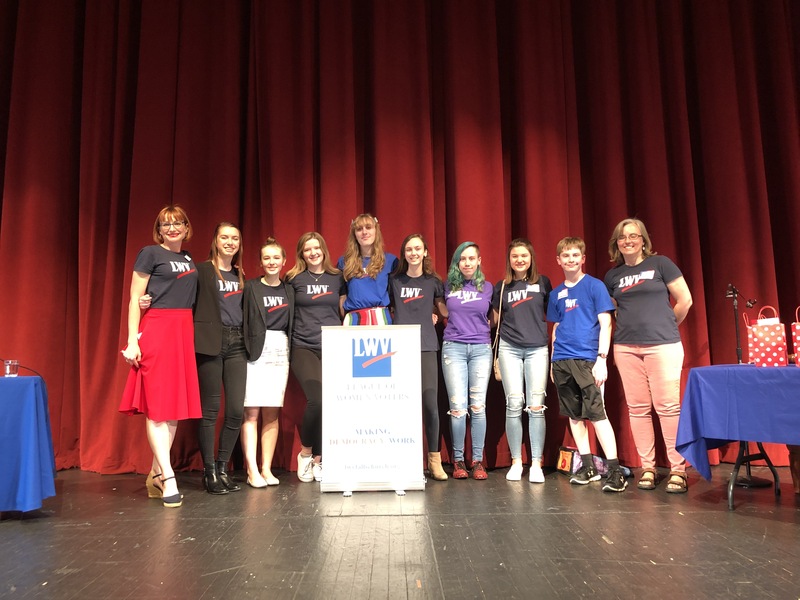 In the fall, LWV Students assisted LWV members with voter eduction and registration and spoke to the entire senior class in the auditorium about the importance of voting. Eighteen fellow students were registered to vote at this fall voter registation event. At the 2018 General Election, LWV student members served as Election Observers and documented the administration of a midterm election. LWV Students led a session in front of 15 of their peers in April and talked about how hard it is to vote in Virginia. They also played civic games to demonstrate the fun in civics. Also in April, students helped register all of the 17 year olds who will be 18 by the 2019 General Election. They also distributed vote411.org cards to help fellow students know where and when to vote in the June Primary Election and General Election. Around 65 students were registered to vote at this spring voter registration event. Eight students from the GMHS LWV student unit worked as a team to host two candidate forums--senate district 35 and Falls Church/Arlington Commonwealth Attorney--to educate high students and their parents and teachers about the issues and candidates running in the June Democratic Primary election. Over 200 people from the community and surrounding areas joined students and League members! This team promoted the programs throughout the school, served in a variety of candidate forum roles, including moderators, question screeners (questions were collected from the audience), time-keepers, question gathereres, audio, and video recording, and succeeded in hosting LWV of Falls Church's best attended and most informative progam of the year! To see the recording of the two candidate forums, click here! Congratulations to our GMHS students and their commitment to make democracy work in Falls Church! This first year of having at GMHS is resounding success! We look forward to more great events in the coming 2019-2020 school year! Special Thank You to: Julie, Ciara, Zoe, and Pam Mahony for getting the student unit off the ground! And thank you to: Ciara, Julie, Zoe, Acacia, Lily, Grace, Sam, Sam, Katie, Pam, Stacey, and Amy for hosting two successful candidate forums.